So blessed by a position favorable for the defense yet so cursed by such a shortage of men and guns. The game is Scourge of War, with the Antietam DLC. 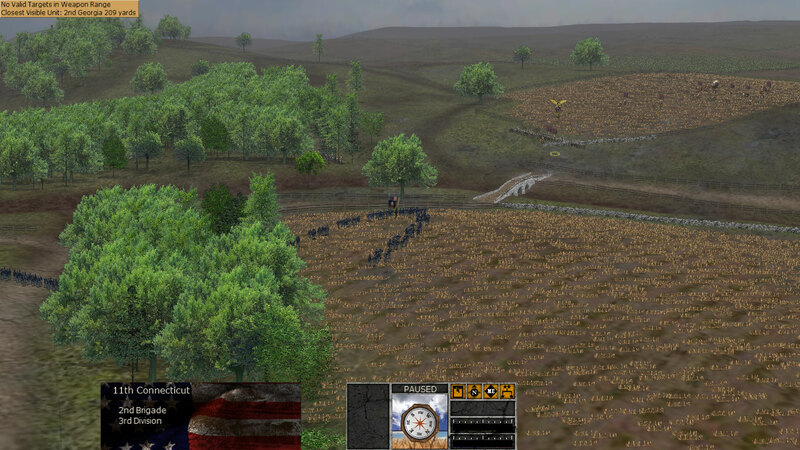 This 3D tactical war game is certainly unique and recently it has been adopted by the United States Army College for Senior Officer Training. 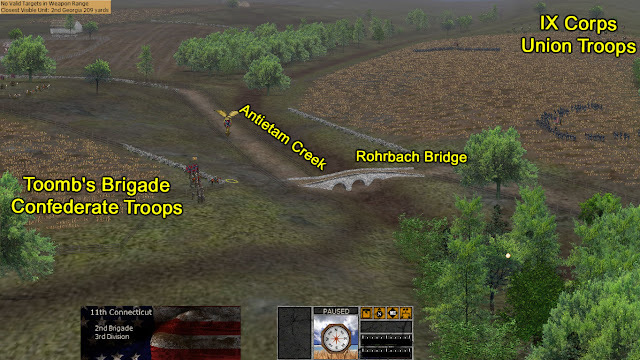 This scenario is about the action at the so-called "Burnside Bridge" during the American Civil War's Battle of Antietam (by that time the bridge was named the "Rohrbach Bridge"). I am playing as the Confederates and my mission is to keep control of this bridge. The Union officers are eager to take it, and by the scenario start we are in contact, my infantry being a depleted Brigade (Toomb's Brigade) supported by two batteries of artillery. The Union infantry is already moving towards the bridge and their artillery fire is intense. A panoramic view from the Union side. The Union 11th Connecticut is moving in for an early assault of the bridge. The terrain is optimal for the defense. The hilly terrain at both sides of the Antietam creek is great for long range fire. The approaches to the bridge are fully exposed and that will make the Union men's lives short. However, we are just holding the bridge with a depleted brigade supported by two batteries of artillery. The enemy ... a whole Corps! I went by the battlefield a few years ago during the Illumination - it was amazing. I'd like to see how this game plays out. Thanks for your comment. A new entry is up by now. Hope you enjoy it and get a chance to play this game.